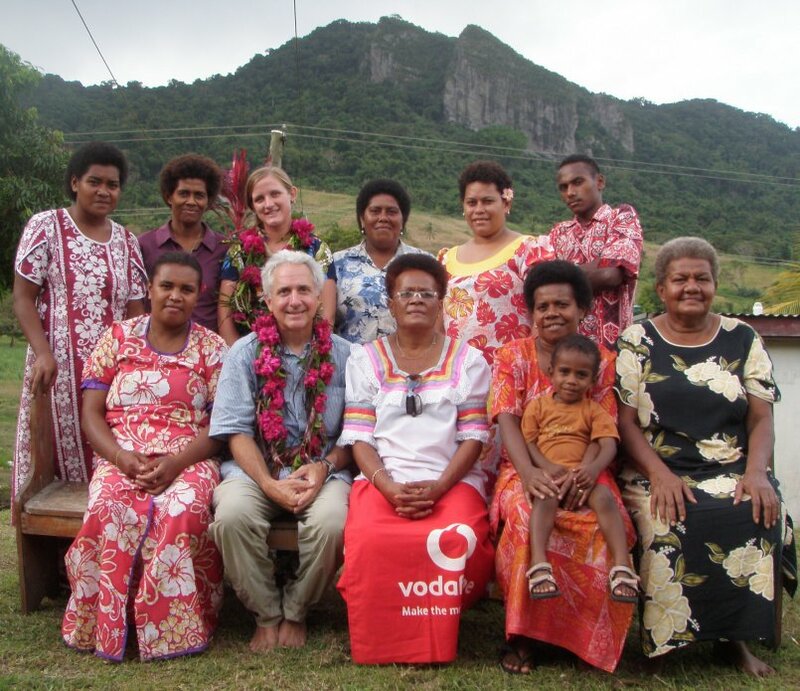 In 2008 I moved back to Fiji. Most days I am either kayaking, fishing, snorkeling, building kayaks or . 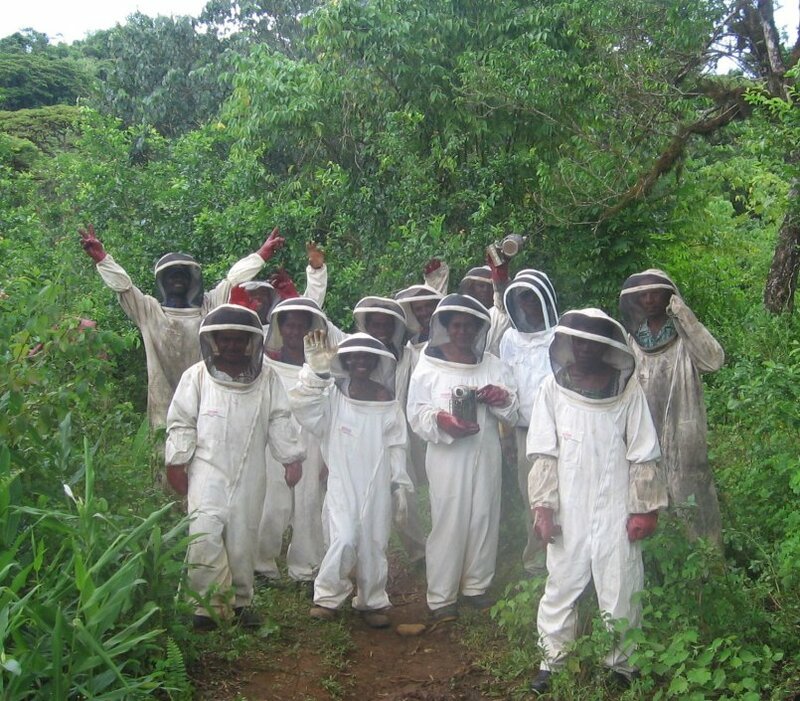 . . training beekeepers! This is my semi-retirement. 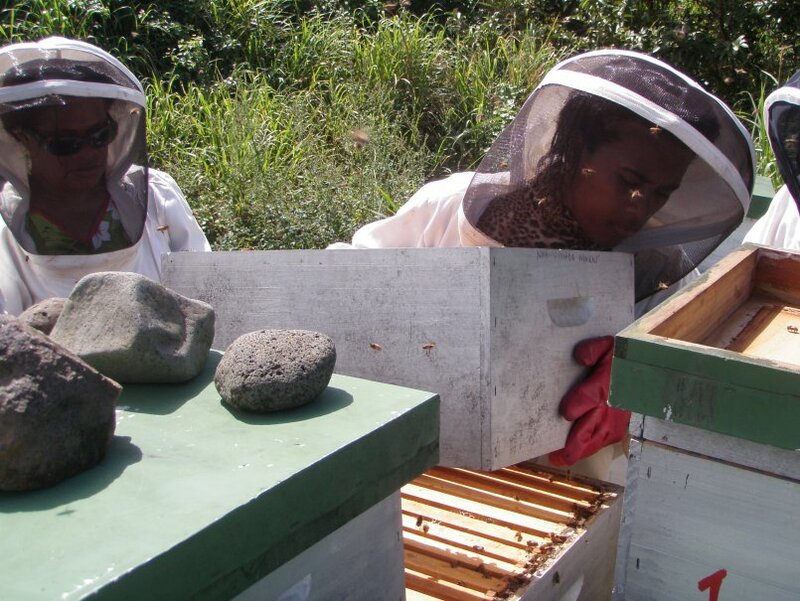 Since the 1980's when I last lived here, beekeeping in the Western Division of Fiji has greatly expanded with help from both domestic and foreign assistance. However, this country of less than one million people still imports approximately 20% of its honey (my estimate) and there are many failing beekeepers. Many farmers started beekeeping without adequate training. There are only a few skilled beekeepers here. 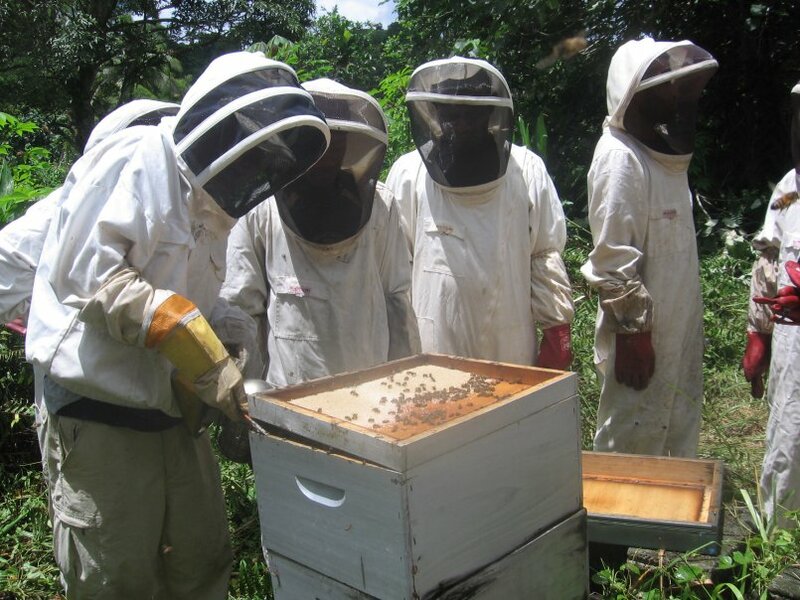 Some started with aid money and some with a bank loan, but most do not know basic beekeeping skills such as how to start new colonies or prevent wax moth damage. 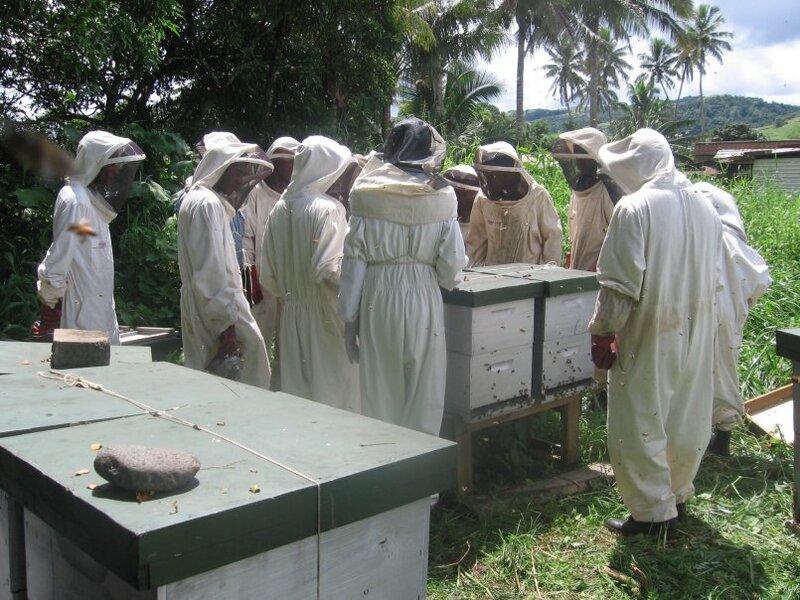 Fiji's beekeepers in the Western Division do not have the benefit of traditional agricultural extension help, government or NGO-sponsored training, or access to beekeeping books in any language. Maybe someday I will write one in the Fijian or Hindi languages. Starving bees. Beekeepers sometimes harvest too much honey and fail to feed bees when no nectar is available. Wax moth damage to honey comb. This is due to poor hive monitoring. Poor care of woodenware. Hives will last 10 years or more if properly cared for. 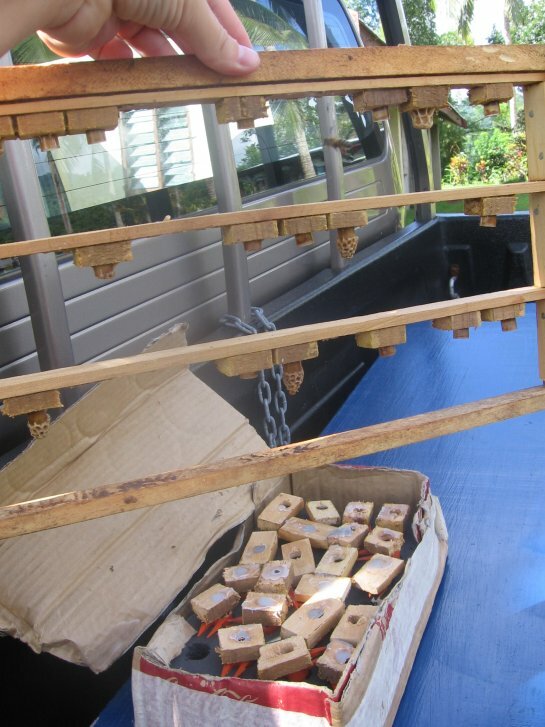 Many beekeepers do not repaint to prevent rot, fail to tilt hives to prevent bottom board rot, and stack boxes sloppily so rain penetrates the hive. Inability to create new bee colonies by division or capturing swarms. 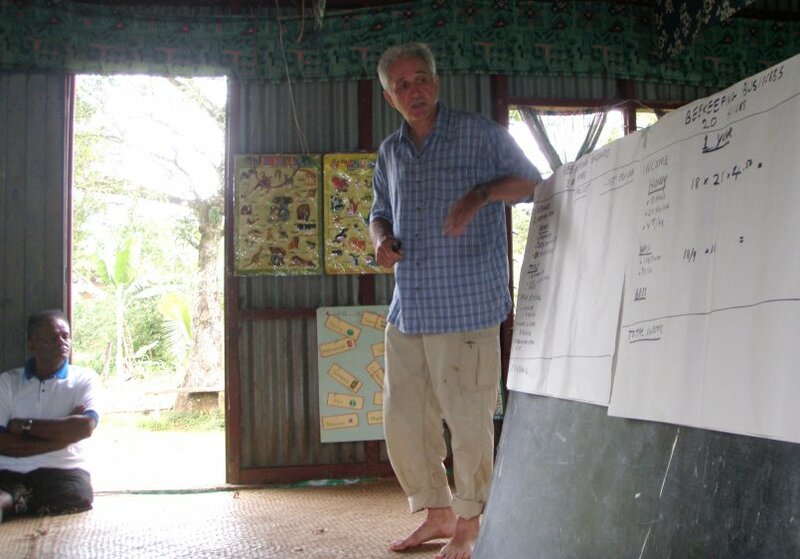 Failure to protect hives from cyclones and flooding. Here are some photos from my beekeeping work during the past year. I've helped beekeepers raise queens, split c olonies and learn basic beekeeping skills. 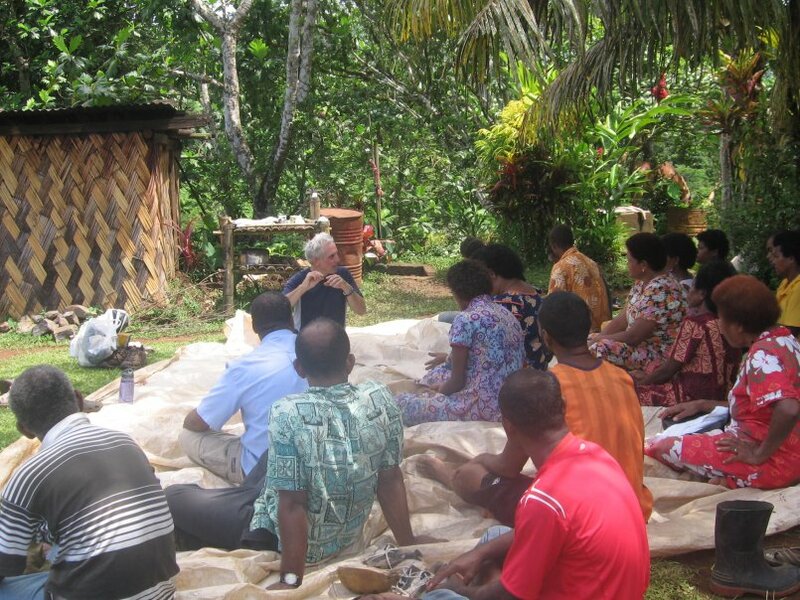 Formal beekeeping workshops that I taught were arranged and facilitated by Semi Kacanavesikula of the Fiji government's National Center for Small and Micro Enterprise Development (NCSMED). 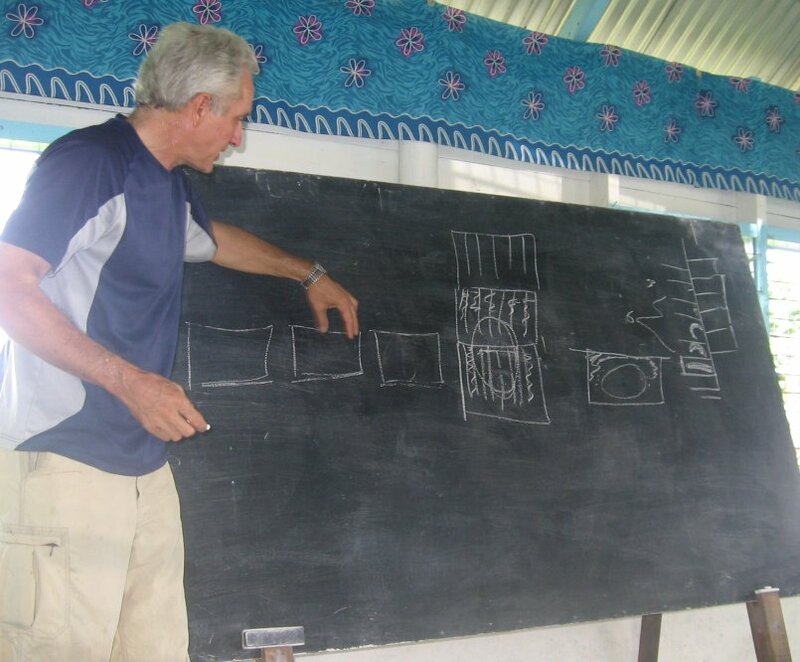 Some technical training was delivered with help from U.S. Peace Corps volunteers. I have also worked a little with the Saraswati organization helping beekeepers start and build their beekeeping businesses. The bees here are a cross between the 'black bee' from northern Europe and the Italian bee. The black bee runs on the comb and is inclined to sting when provoked. The Italian bee is quieter on the comb and gentler. 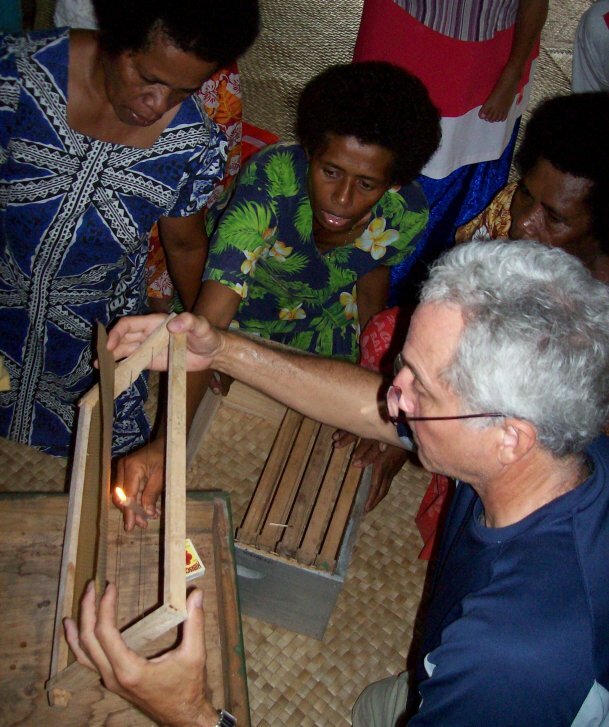 Fiji needs to improve its genetic honey bee stock! 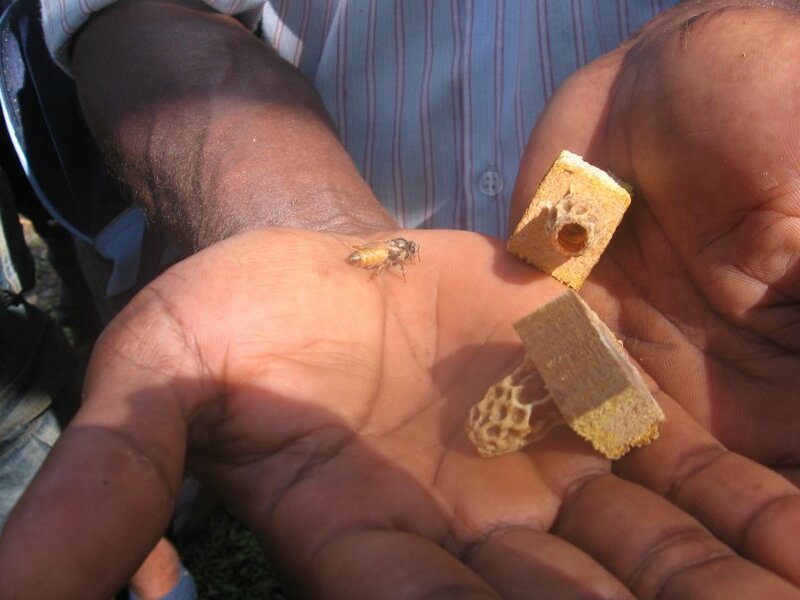 Last rainy season my friends and I raised approximately 100 queen cells that we distributed to beekeepers. I am raising several hundred this season. 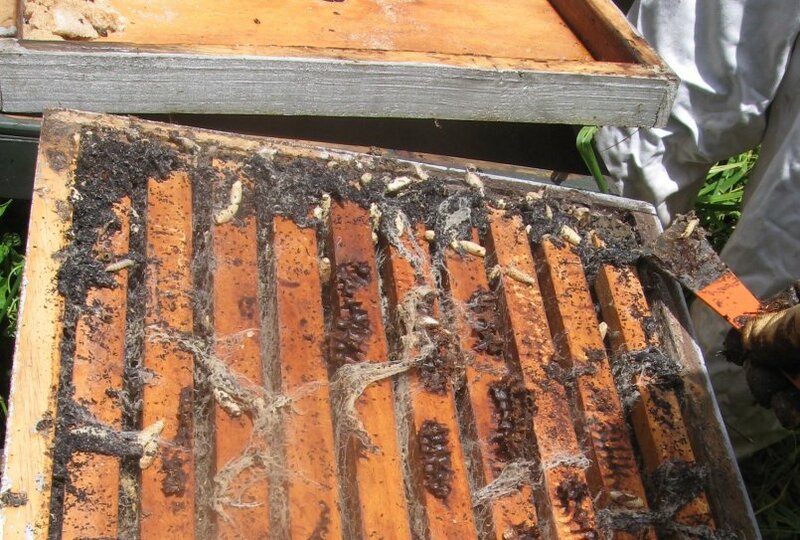 During the rainy season (November through March) here in Ra, bees often need supplemental feeding. We feed with dry granulated raw cane sugar on the inner cover. They only eat the dry sugar if they are starving. 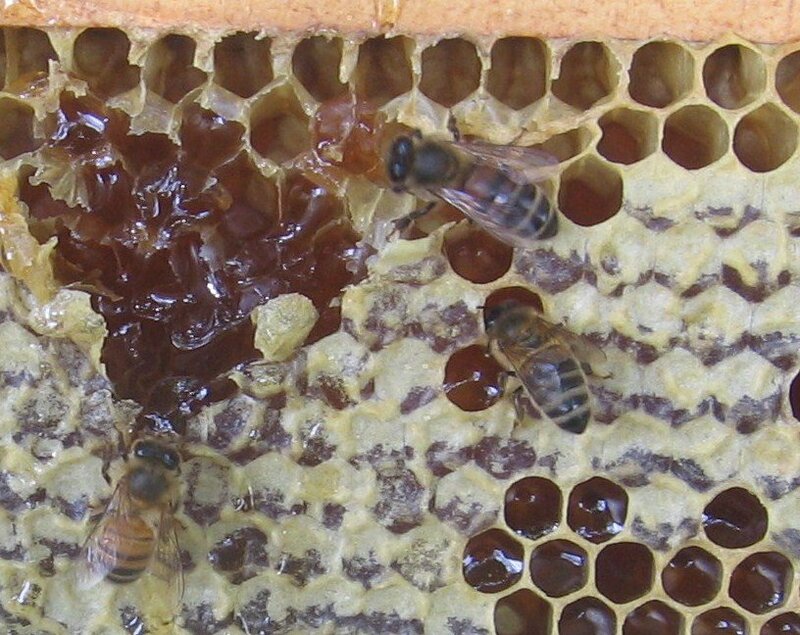 Except when breeding queens, we generally feed only dry granulated sugar, instead of syrup, because syrup may contaminate honey if the bees store it in the honeycomb, and syrup promotes bees robbing each other's hive if not done properly. Approximately one-quarter of the beekeepers here are women. Both indigenous and Indo-fijan women keep bees. Hives are kept at least 15 inches above the ground to prevent cane toads from feasting on bees. 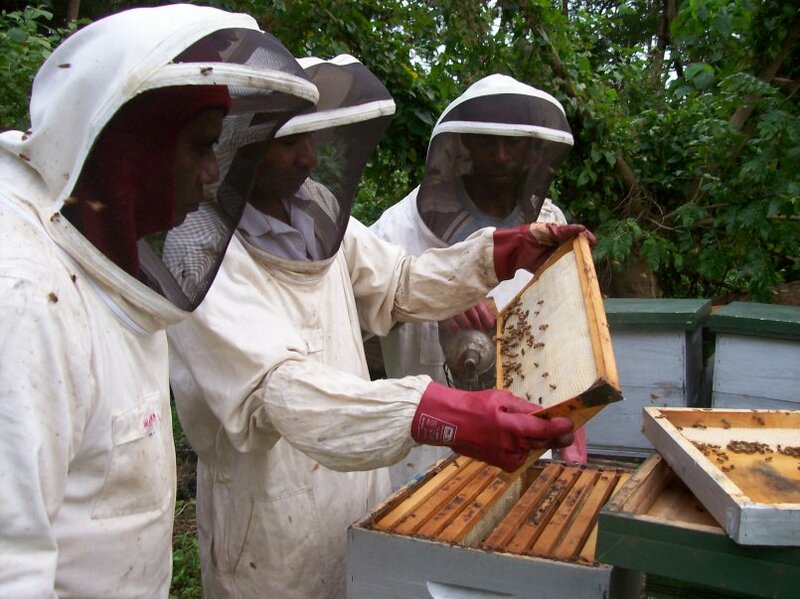 I am now delivering more technical beekeeping training focused on dividing colonies and queen-rearing. Our schedule calls for a visit to 45 bee yards in 28 villages during a one-month period. U.S. Peace Corps volunteer Leslie Currie-Leonard and I co-taught a series of 2-day training sessions on personal and business financial skills in 5 villages and 1 town. The first day of training focused on personal financial skills that emphasized budgeting and increasing awareness of sources of income and spending habits. The second day focused on how to create a financial plan for an agricultural business. Participants learned how to use estimates of income, cash expenses and labor hours to evaluate the financial return of beekeeping. Together, we built a financial plan for a 20-hive honey business. This involved making assumptions on cash costs, labor, income and life of equipment. The participants later broke into groups to use the same training on a different business idea of their own choosing. 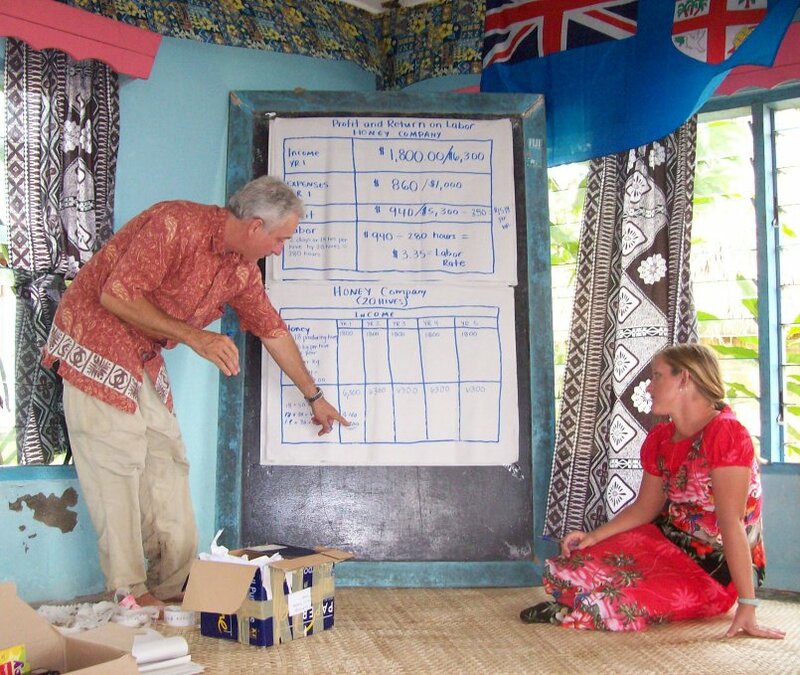 They built financial plans for growing capsicum (bell peppers), taro, sugar cane, a village bakery, fish farming, catering, a general store, commercial fishing, selling fish retail, and mat-making. The participants also learned concepts such as product pricing, understanding customers, and benchmarking against competition. 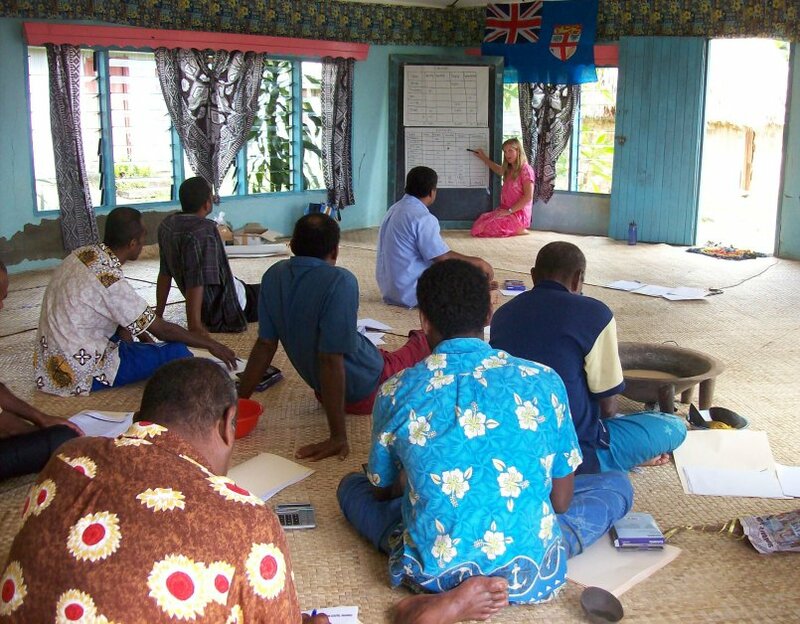 These training sessions were organized by Semi Kacanavesikula, (photo on left) through the National Center for Small and Micro Enterprise Development Department of the Fiji government. We almost always had more participants for the second day of the 2-day workshops, and more people often joined during both days. I take that as a sign that the participants enjoyed and learned from the sessions. 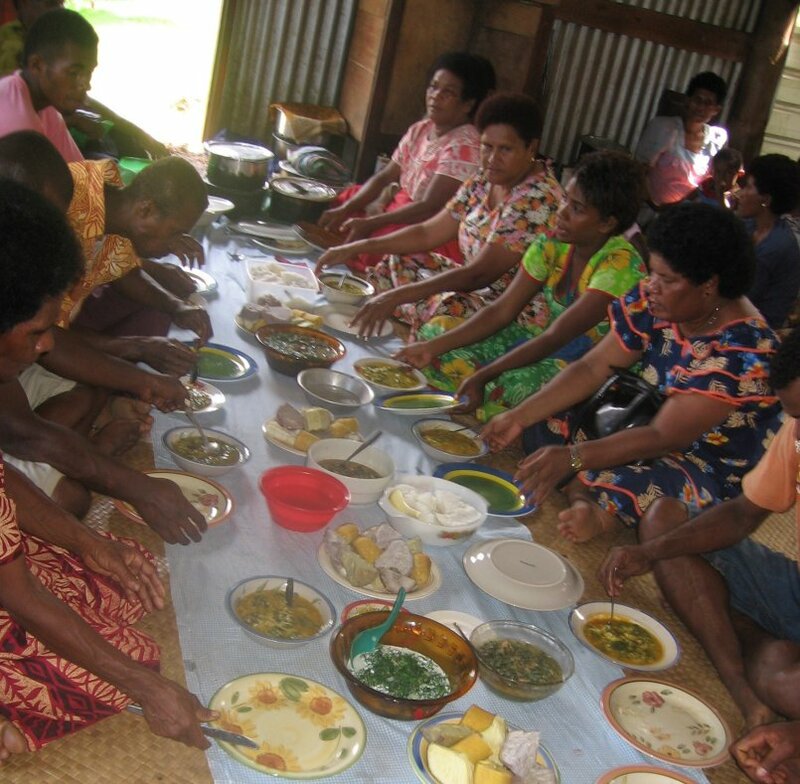 Some villages required overnight stays and others required boat rides, but we were always welcomed, well-fed and enjoyed the visits. 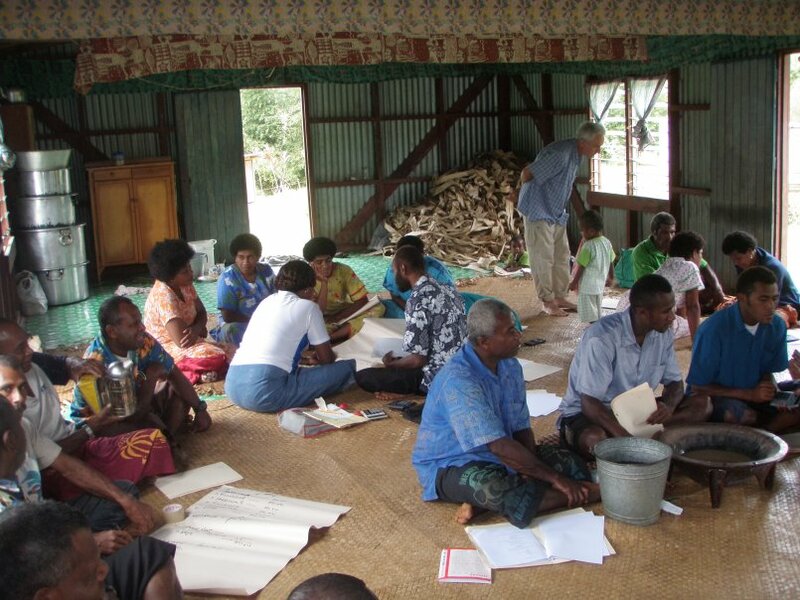 The training sessions averaged participation of approximately 20 people - some beekeepers and some non-beekeepers at each session. I am grateful to Fiji's National Center for Small and Micro Business Development for organizing most of the beekeeping training. Created by John Caldeira November 2009.